Kepro AMOXYCILLIN 15% LA INJ. 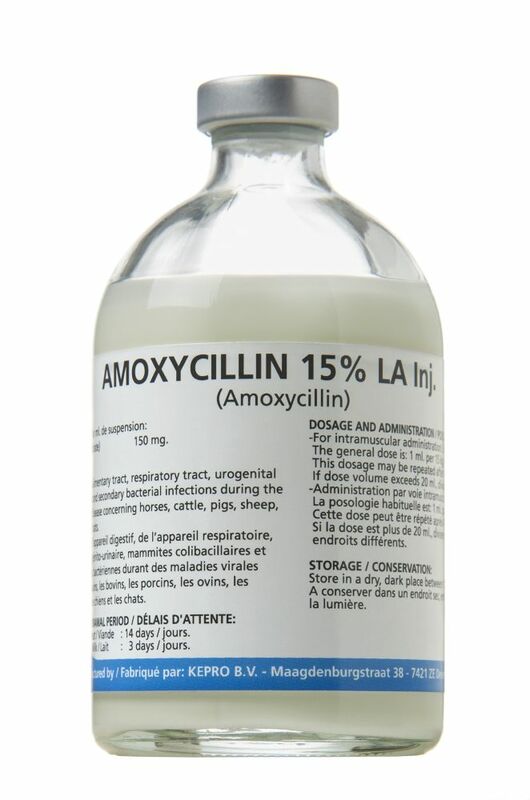 Amoxycillin long-acting is a broad-spectrum, semi-synthetic penicillin, active against both Gram-positive and Gram-negative bacteria. The range of effect includes Streptococci, not penicillinase-producing Staphylococci, Bacillus anthracis, Corynebacterium spp., Clostridium spp., Brucella spp., Haemophilus spp., Pasteurella spp., Salmonella spp., Moraxella spp., E. coli, Erysipelothrix rhusiopathiae, Fusiformis, Bordetella spp., Diplococci, Micrococci and Sphaerophorus necrophorus. Amoxycillin has many advantages; it is non-toxic, has good intestinal resorption, is stable in acidic conditions and is bactericidal. The drug is destroyed by e.g. penicillinase-producing staphylococci and some Gram-negative strains. Amoxycillin 15% LA Inj. is effective against infections of the alimentary tract, respiratory tract, urogenital tract, coli-mastitis and secondary bacterial infections during the course of a viral disease in horses, cattle, pigs, sheep, goats, dogs and cats.